I’ve really been trying to up my enchilada game lately. 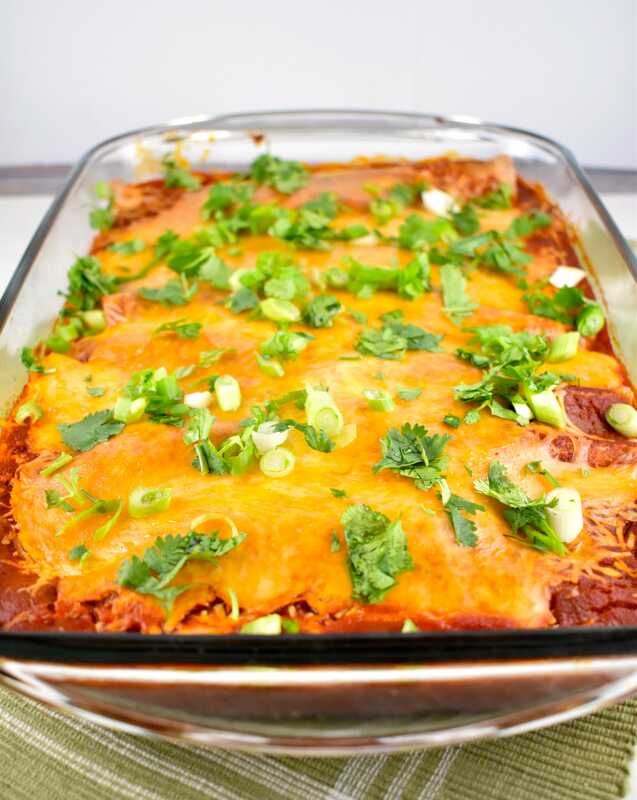 They’ve always been one of my most favorite Mexican foods that I consistently order at Mexican restaurants, but I knew that I could easily make my own lighter, healthier enchiladas at home. So I’ve been experimenting in the kitchen, and my favorite version so far is my Chicken and Black Bean Enchiladas Recipe. 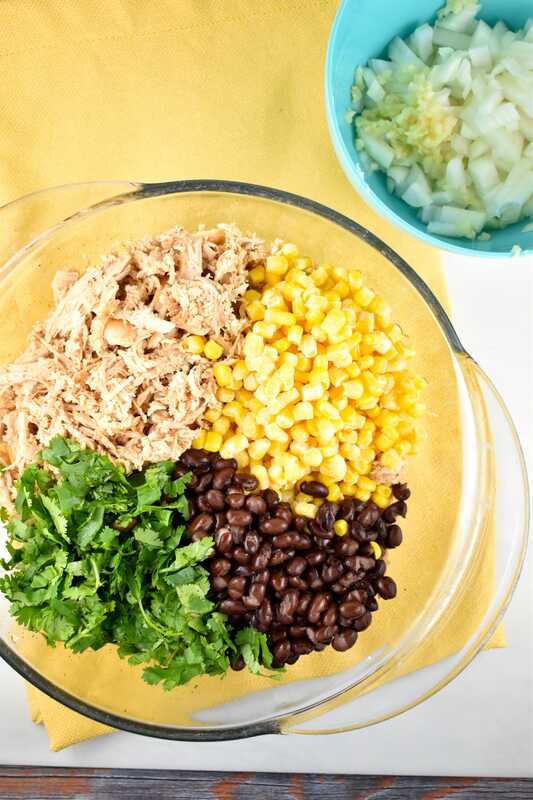 It is PACKED with chicken breast, black beans and corn – all zero Points foods with the new Weight Watchers Freestyle plan! This helps to make the enchiladas incredibly filling and satisfying. Because, let’s face it, there’s nothing sadder than a thin, flat, flimsy enchilada. But the secret to kicking these enchiladas up a notch was the sauce. I really wanted to try to make my own enchilada sauce, and not use the canned ones. But I assumed this was going to be a tedious process that would take lots of time, ingredients, and effort. I was pleasantly surprised when I discovered that making your own enchilada sauce is actually a pretty easy (and delicious!) process. And let me just tell you that using your own, homemade enchilada sauce is a game changer. It’s time to ditch the canned enchilada sauce, and make your own instead! And it’s really not as complicated as you think. With just a few simple ingredients and steps, it’s never been easier. And without a doubt, this is the best enchilada sauce recipe ever! Once you’ve tried it, you’ll never use the canned version again. To make your own enchilada sauce from scratch, just start by heating olive oil in a saucepan over medium high heat. Then you’ll combine tomato sauce, chicken broth, garlic, ground cumin, chili powder, and chopped chipotles adobo sauce. Let it come to a low boil, then turn heat down to low, cover, and let simmer for 10-15 minutes. Season with salt and pepper as desired, and your done! Another extra step I took was to roast my chicken breasts. I did this simply because I REALLY wanted chicken enchiladas, but didn’t have any leftover pre-cooked chicken on hand. But, once I tasted how much flavor that freshly roasted chicken brought to this dish, I realized that it was worth that little extra bit of effort. If you don’t feel like cooking the chicken, or you just simply don’t have the time, don’t worry – you can absolutely use pre-cooked, leftover chicken. The end result was perfection. Seriously, this was the best chicken enchilada recipe ever. And I promise, you will not regret taking the extra bit of time to make that sauce! You might even want to double or triple the recipe so you can freeze the extra! And now these Chicken and Black Bean Enchiladas have become my go to dish for everything – when I need to take a meal to a friend, when I need to bring a dish for a potluck, when I want to make a freezer meal, and when I need a Cinco de Mayo recipe. They never fail me. You can jazz them up with extra toppings if you’d like – sour cream, jalapenos, chopped onions, cilantro, avocado – you know the deal. 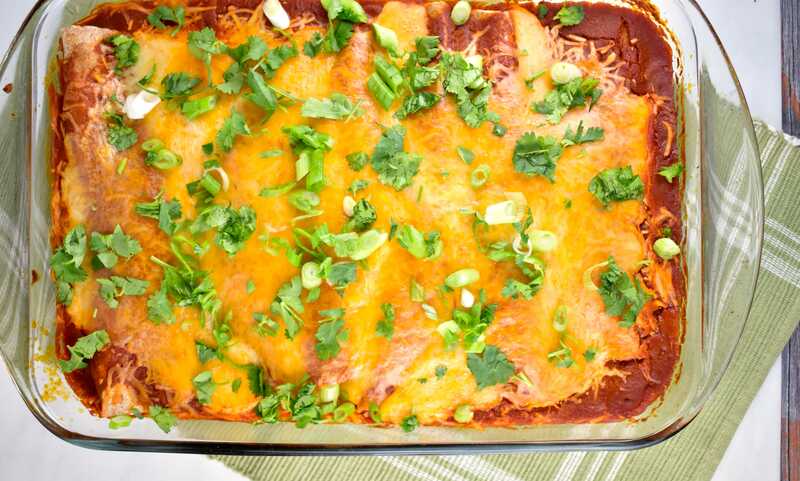 But you’ll be thrilled to see how incredibly satisfying these enchiladas are. A serving is TWO enchiladas, not one. I mean, really, who eats just one enchilada? Make your own homemade chicken enchiladas from scratch, that are just as delicious as any restaurant. 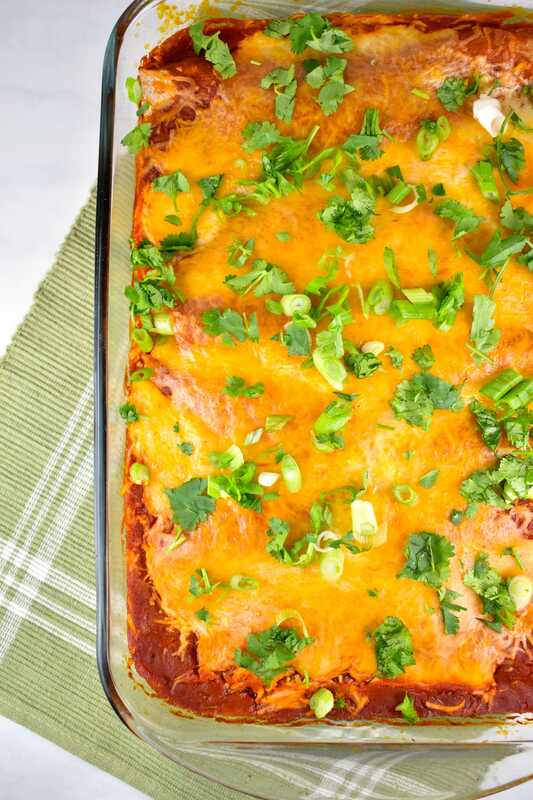 It’s the best chicken enchiladas recipe I’ve ever tried, and it’s made with the most amazing and easy enchilada sauce. Preheat oven to 400 degrees. Spray a baking dish with cooking spray. In a small bowl, mix ground cumin, chili powder, garlic powder, salt and pepper. 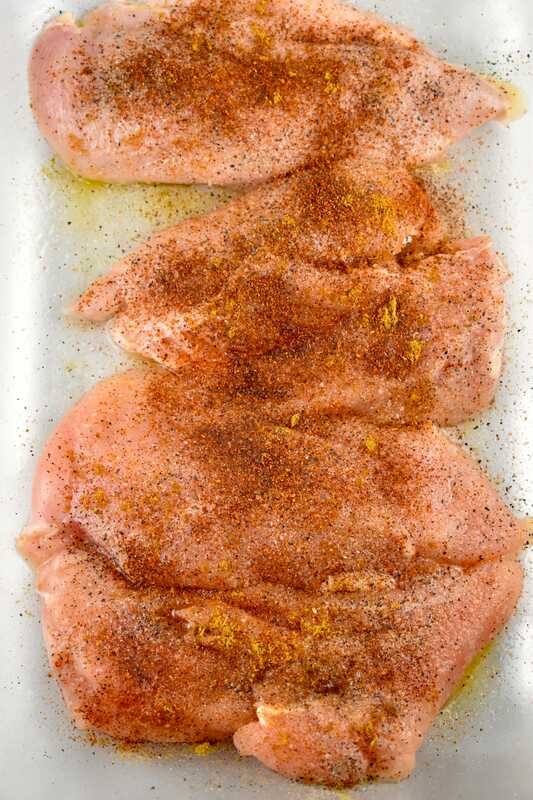 Set chicken breasts in dish, and season with seasoning mix. Place in oven, and roast for about 20 min, or until chicken is cooked through. Transfer chicken and any pan juices to a large bowl and tent with foil. When cool enough to handle, shred using two forks. Heat oil in a medium sized saucepan on medium high heat. Add in all ingredients and bring to a low boil. Turn heat down to let, cover, and let simmer for 10-15 minutes. Season with salt and pepper as desired. Set aside. Preheat oven to 400 degrees. Spray a 13 x 9 baking dish with cooking spray. Heat oil in a large skillet. Add in onions and garlic and saute for about 1-2 minutes. 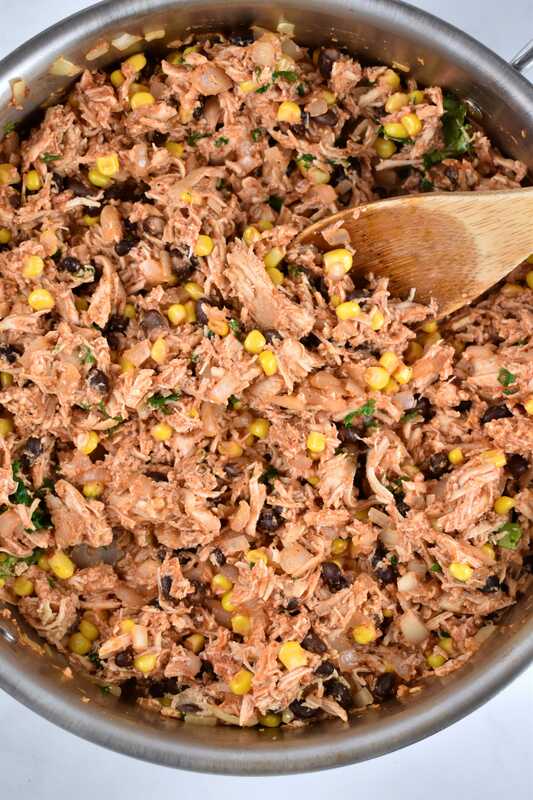 Add in shredded chicken, cilantro, corn, black beans, lime juice, and ¾ cup of the prepared enchilada sauce. Season with salt and pepper as needed. Cook for about 5 minutes, then remove from heat. To assemble enchiladas, add about 1/3 cup of chicken and bean mixture onto each tortilla. Roll it up, and place into baking dish, seam side down. 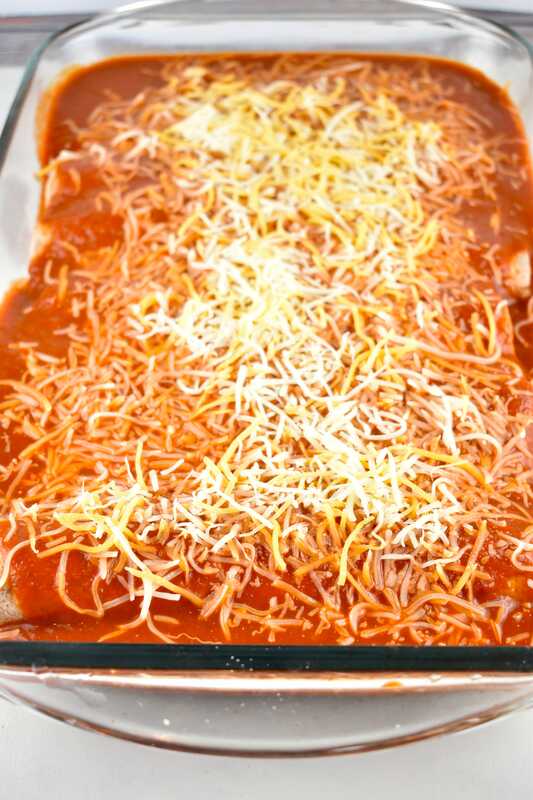 Pour remaining enchilada sauce evenly over the enchiladas, top with the shredded cheese, cover with foil, then bake in the oven for for about 20 minutes. Garnish with chopped scallions or cilantro if desired. So excited to make these! The quantity of cilantro is not showing up for some reason? How much cilantro goes into these? It’s about 1/3 cup. I just updated the recipe. Thanks for catching that! We just finished these for supper. I will be making these again, wonderful! So glad you like them!! My family loves when I make these for dinner.